Released only in the UK, Japan, France, Spain, Australia, and parts of Asia, this title was never released in the US market. Hard times have befallen the Ghostbusters. Although they saved New York from a rampage of evil spirits, a series of unfortunate events made them unpopular. Once heroes, they were now considered outcasts - fakes and frauds. The Ghostbusters had split up, and everyone had gone their separate ways. But trouble is brewing under New York City. When Peter's ex-girlfriend Dana asks for help, the Ghostbusters reunite and discover a river of pink slime flowing underground. It leads right to the city art museum where the vengeful ghost of Vigo, and evil 17th century tyrant waits impatiently in a painting. Legend has it that Gigo was a cruel sorcerer who vowed to return and bring another reign of terror to Earth. He has possessed Dana's boss, Janosz, who will kidnap her baby so Vigo might live again - in Dana's child! Someone must stop Vigo, rescue Dana's baby, and save New York City! Time is running out, and Vigo is gaining power with each passing moment. So, who are you gonna call? You got that straight - Ghostbusters! 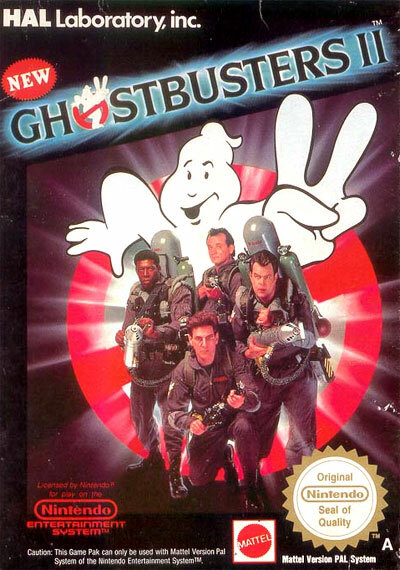 The Ghostbusters must clear five stages of ghosts, and each stage has a powerful ghost waiting at the end... then it's time to tackle Janosz and Vigo!